“Andreesen Horowitz’s Ben Evans tweeted out a trailing 12-month chart of iOS and PC sales using data from IDC, Gartner and his own company showing the rising trend of iPhones, iPads and iPod touch devices,” Kevin Tofel reports for ZDNet. MacDailyNews Take: Add in the 20+ million Macs sold in the last year and Apple devices are now outselling Windows PCs. Do these numbers include the Windows Phone?
. . . just kidding. Haters today are a different bunch than the original haters. 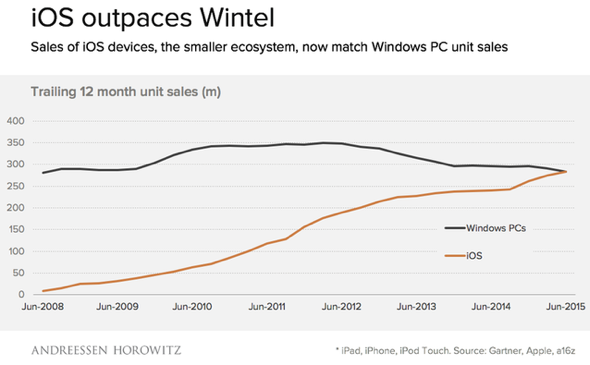 The original haters crowed about Microsoft’s dominant market share and mocked Apple’s products as overpriced toys. What’s that you say? The arguments are exactly the same now as they were then? That’s because haters today are completely UNORIGINAL, repeating the same old arguments because they can’t come up with new arguments that are any good. I still, after days of research, haven’t found out how Microsoft could have possibly beaten Apple in the 90’s. I mean, its easily seen that Microsoft, however horrible its systems get, always has had the most popular software, from games to assistive programs for the disabled. has I’ve banged the drum before: where is Apple’s Mac marketing? No serious Ad campaign since Mac ? Pc guy more than half a decade ago in spite of Win 8 fiasco . Macs have been bright spot every quarter report yet Apple sadly neglects pushing it. Posted this from home earlier this morning, but it didn’t show up here so I’ll do it again. Got a more accurate count being at work this time. When given a choice (as we’ve been able to do recently), people choose to use a Mac. I’m betting there will be 2 more Macs soon too. I should add, that sadly, most people do not get a choice at work. Banks, hospitals, etc. The Business world is what’s keeping the PC on life support because they’re stuck with old software and things made just for the PC that makes it more difficult to ditch.